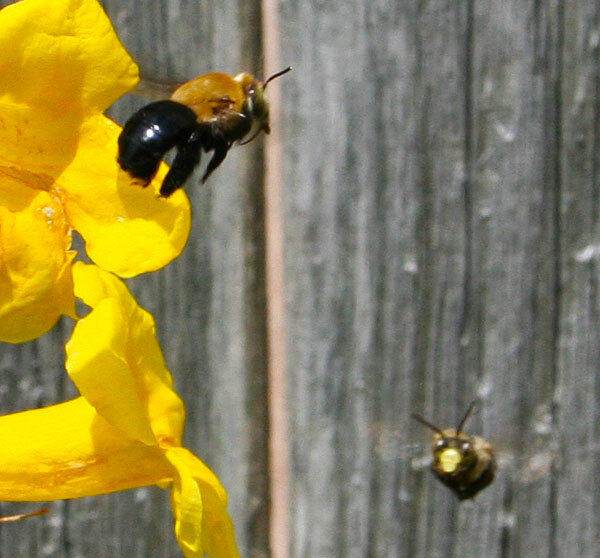 The bees were working over the yellow bells (aka esperanza) in my father-in-law's backyard, and so I hauled out the camera on Saturday to try to capture some of the action. I was so focused (pun intended) on the bee leaving the bloom in the following photo that I didn't notice the one that's on approach to the landing area. Is it just me or does the one facing the camera have a cartoonish look on his face? Looks like the hornet the schools around here use for a mascot. Fighting mad! Fortunately, these were so preoccupied with the flowers that they never seemed to even notice me! Oh he's hamming it up for the camera, all right. Rob, sometimes it's better to be lucky than good. That's my general photographic modus operandi: close my eyes and hope for the best! This page contains a single entry by Eric published on August 31, 2009 6:38 AM. Mantid on Board was the previous entry in this blog. Bugged is the next entry in this blog.